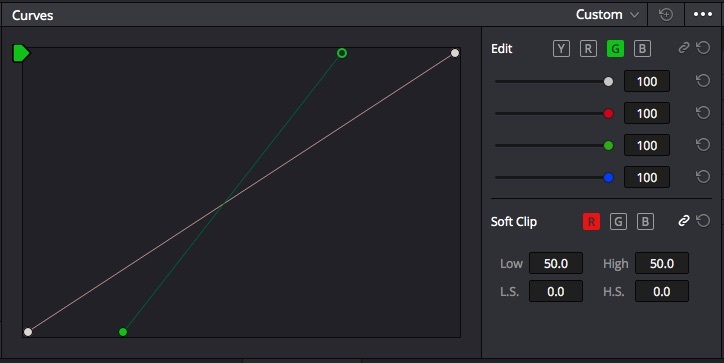 Before we dig into Gem #1, DaVinci Resolve 12 has given us a new ‘unified’ Curves interface which can use a little explanation. Starting with Resolve 12, no longer do we need to jump into a larger ‘gigantor’ interface to make niggly tweaks to our custom curves. In addition, more closely mimicking the Avid Symphony curves editor, the end-points of our curves are now free floating. This has been a feature request of mine for quite a few years! 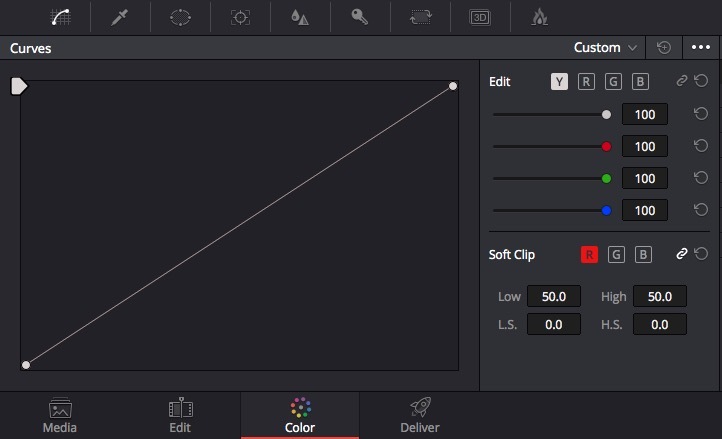 The curve editor in Resolve 12 has been completely redesigned. Resolve 11’s Gigantor Curves Interface with the green and blue channels set for contrast expansion of AB in the LAB colorspace (click to open full size). My problem here? Look at the roll-off at the 100IRE and 0IRE marks. See how the curves sharply roll-off? And then there are the additional points I need to add to the middle of the graph to straighten out the contrast expansion as much as I can. 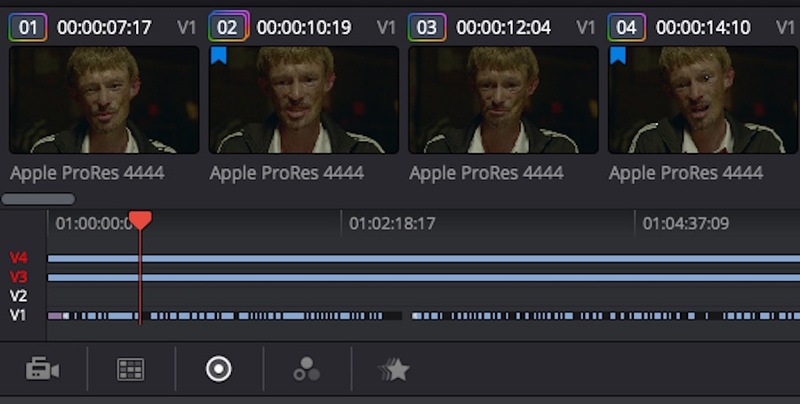 I need to write 3 points simply because Resolve 11 (and earlier) wouldn’t let us move the end points and create a perfectly linear contrast expansion. I consider this a Faux-LAB grade. It works. I use it. But other apps do this more cleanly and I prefer a perfectly linear contrast expansion since I’m a bit compulsive about these things. Take a close look on the overlay between the A and B channels (click to open the screenshot full size). The blue B channel meanders giving us more and less saturation as blue pixels move up and down the tonal range, compared to the A channel’s perfectly linear slope. THAT’s the advantage of being able to move our endpoints in the Curves graph, much greater precision in our curve writing. While playing around with LAB, I pulled down the ‘ellipses’ option menu and found the ‘Copy to’ command. Click on the ‘ellipses’ pull-down menu to expose the new ‘Copy to’ commands. When working in LAB, you’ll usually want to start with the A and B channels perfectly aligned to each other. Doing this by hand would be imprecise but thanks to the ‘Copy to’ Command, having made my change to the green A channel, I can perfectly copy that curve to the blue B channel. Thank you, my Blackmagic overlords. Are the bottom endpoints pulled into the box precisely as far as the top endpoints are pulled in? Is the center point of the AB channels perfectly crossing the center point of this graph, keeping the correction completely neutral? I have no idea. 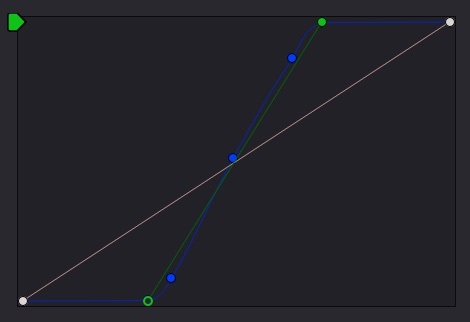 In Resolve 11 I’d just have to make sure the curve passes through the mid-point of the lined graph and I’d know my correction is ‘passing through neutral’. In Resolve 12 I have to take a ruler and measure my screen. There’s a reason Photoshops Curves editor has a selectable grid size. Grids are USEFUL! This is especially true when grading LAB. LAB benefits from the precise adjustments of the endpoints. The best we can do with this new interface is approximate. Which is all we could do in Resolve 11 but a completely different approximation. 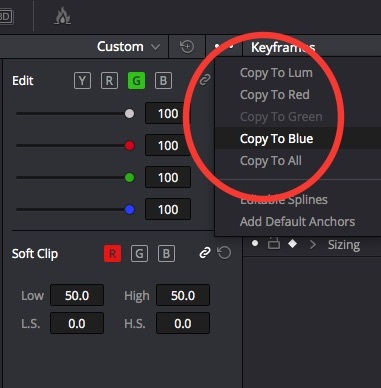 So – while I appreciate the new Curves interface; while the new ‘Copy to’ command is indeed a Little Gem—we’ve gained one form of precision while losing another. How do you make a HappySad emoticon?